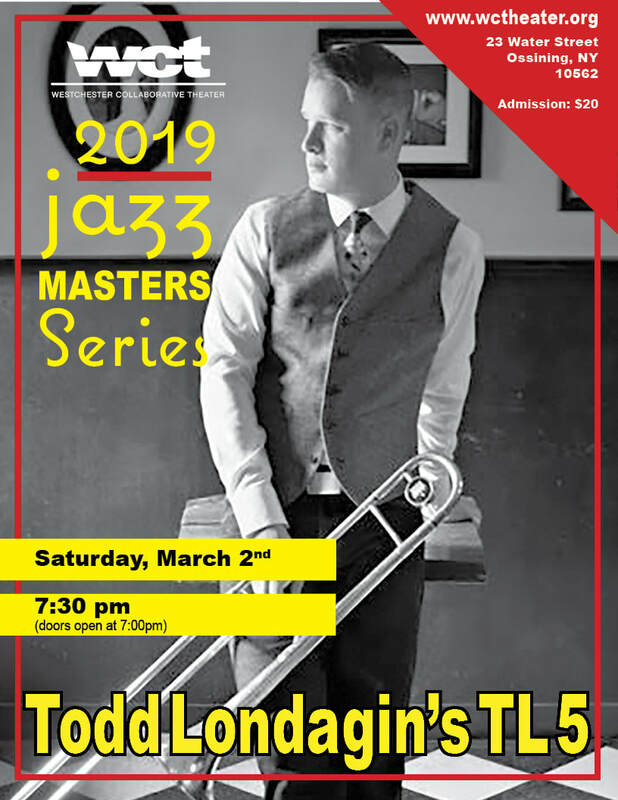 On Saturday March 2nd, WCT welcomes Todd Londagin's TL5. For anyone who loves joyful, unpretentious, but highly creative and spontaneous jazz, Todd Londagin’s TL 5 will be a delightful discovery. The vocalist/trombonist’s music is a vivid reflection of his personal roots. Growing up playing music and street busking in an itinerant, alternative-lifestyle family, he lived in buses, cars, homemade boats or tents, traveling throughout the U.S., Mexico, Canada and Europe. Home-schooled and with no formal musical training, Todd honed his skills the old-style way through influences like Nat King Cole, Billie Holiday, Ella Fitzgerald, early Sinatra and New Orleans traditional jazz, especially Jack Teagarden (one of the few other trombonist/vocalists in jazz) and later, J.J. Johnson. All of these diverse elements of musical experience have been brought together in a most refreshing, unfettered manner, and are fully evident in the group's performances. In the company of four longstanding musical cohorts, Todd assembles a repertoire of songs, culled from the Great American Songbook and popular songs, each developed in a most organic fashion by the musicians involved. In testimony to the great jazz tradition of spontaneous creativity, each song sounds as if it was deftly arranged to deliver its story in a planned fashion. But in truth, the songs were developed by the musicians in the best “home-cooking” style.